Microsoft Devices has announced that it's starting the rollout of the Lumia Cyan update to all Nokia Lumia devices running Windows Phone 8 from today. 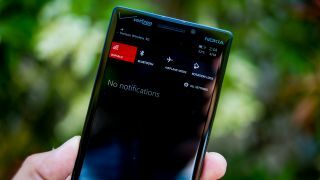 Included in the upgrade is the Windows Phone 8.1 OS update which launched on the Lumia 630, 635 and 930, bringing with it a raft of new features including a pull-down notification bar with quick settings, word flow keyboard and an optional extra column of live tiles on your homescreen. If you're lucky enough to be in the US you'll also get Microsoft's new personal virtual assistant - Cortana - who will be going head to head with Siri and Google Now. It will be heading to other countries later this year. As well as Microsoft features, the Cyan update is Nokia-specific with enhancements to the camera and camera roll, the option to record in surround sound (on the Lumia 1520 and Lumia Icon), the ability to install apps on a microSD card and more. Full details of what the Cyan update entails can be found on the Nokia Conversations blog, although Microsoft does highlight that it will take a few weeks to reach every handset. So if you're rocking a Nokia Lumia 925, the budget-focussed Lumia 520 or any Lumia in between head over to Settings -> Phone Update to see if Lumia Cyan is waiting for you.